Provisional Calendar & New Tyre Supplier For 2015! Out of those I’ve been to Donington on my bike, and possibly done Silverstone for my ARDS test (depending on whether it’s the International circuit, or not) – and those two are at the end of the year! They’re all good tracks, though, and I’m already getting the first pangs of excitement. Brands and Croft will take me back to the old TOCA Touring Cars computer game that I spent many hours on as a young whipper-snapper! Not only are most being forced into spending around £500 on HANS kit to race this year, but the Dunlop tyres used since Vee began have been axed. We were hoping that Class B cars would be allowed to use the Dunlops for this year – Glenn has “more than a few” sets that he’s collected over the years – but sadly this won’t happen. We’ll still use the Dunlops for testing, to try and get some use out of them. The Hoosiers are supposed to be fairly close in lap times, but are ugly as sin! 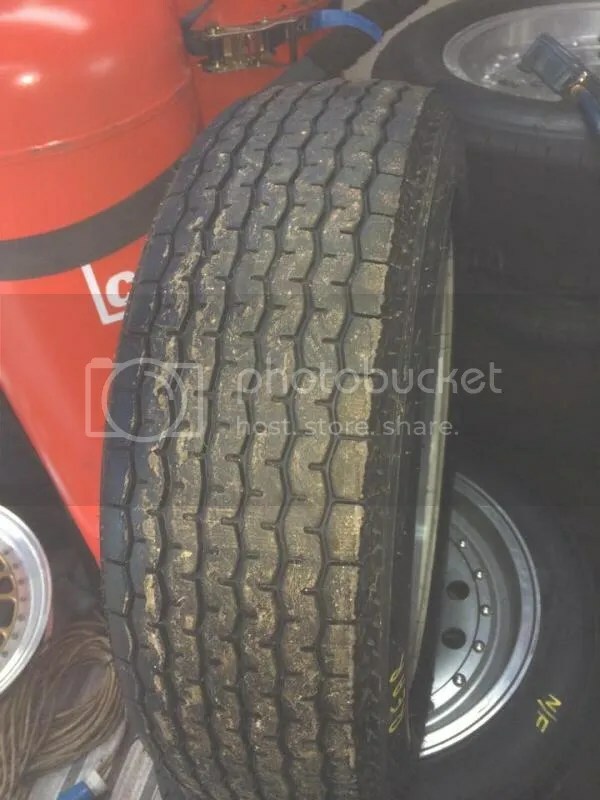 I personally don’t think ‘vintage’ looking tyres will help the image of Formula Vee, but some are using them now for the Australian series, and maybe it’s just my biker mentality playing up a bit. The look of the tread for bike tyres is very important for sales. Having said that, it seems to be extremely hard to get a definite picture of the new tyres from anywhere. If they’re like the picture above, then they’re not so bad. If you heard drivers describing them at Donington in the cafe, you’d have far greater reservations. Still, I’m sure when I’m in the car it won’t bother me, and we’ll soon get used to them! I’d better keep buying those Lottery tickets. A lot more tread than the current Dunlops, but I’m sure you’ll agree that they don’t look that bad at all! I’d much prefer them over the cut slicks that were the other option being discussed – at the very least these will actually work in the wet! give you a shout out from Porter Texas! Just wanted to say keep up the excellent work! Formula vee driver from Australia. When I raced on the Hoosiers they were not as good as the dunlops. I did my first ever Vee test on the Dunlops, but as I couldn’t really drive the car back then don’t have much of a comparison, and have only used the Hoosiers since! I didn’t like the look (tread pattern) at first, but don’t mind it now. I actually think they’re very good tyres. Nice and progressive, and it’s looking like mine will last 2 seasons (without testing), so not bad durability! Of course, as soon as the decision was made to use them, they bumped the price way up, so now we’re paying over £800 per set! It’s said they’re 2 seconds a lap slower than the Dunlops in the dry, but have a much better tread for the wet – which is a huge consideration racing in the UK! It’d be nice to have a sponsor buy a set for me for next year, though! Love the Aussie Vee racing, too – looks like a pretty healthy championship over there like it is here! New tyres have is the cost. How long are you stuck with them for? The alternative they nearly chose for us were some cut slicks – but they’d have been an absolute nightmare in the wet. I think they were cheaper, though. It’s a shame Hoosier had to bump the price up and rip people off, as they’d have made huge profit gains with everyone using them anyway! I think it’s stopped a few more casual racers coming into the series for the odd round, as it’s just not worth them buying the tyres. Hi James we are stuck on the yokohamas for 3 years.the biggest problem with the tyres is that they are taller wider and heavier than the Hoosiers by 3 kilograms per tyre.the direct result is more revs more things coming loose and slower lap times by up to 4 seconds per lap.